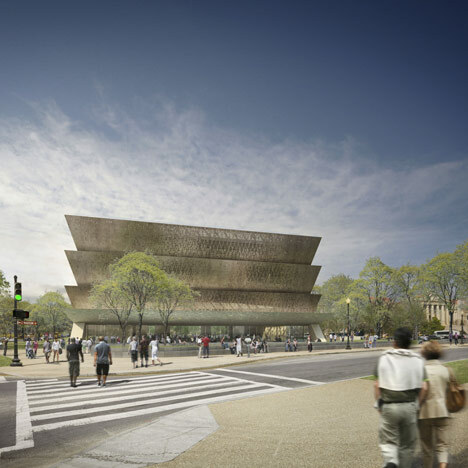 Construction will begin this week on the Smithsonian National Museum of African American History and Culture in Washington DC designed by architect David Adjaye. Adjaye Associates teamed up with American architects The Freelon Group and Davis Brody Bond to win the design competition for the museum back in 2009, under the collaborative name Freelon Adjaye Bond/SmithGroup (FAB). Sited beside the National Museum of American History and the Washington Monument, the museum will accommodate more than half of its volume below ground. Bronze plates will cover the tiered exterior of the building, perforated in patterns that reference the history of African American craftsmanship. The museum is scheduled to open in 2015, and you can see the original competition-winning proposals for it in our earlier story. You can also see more stories about David Adjaye here. Situated on the Washington Monument grounds the museum maintains a subtle profile in the landscape – more than half is below ground – with five storeys above. The corona is based on elements of the Washington Monument, closely matching the 17-degree angle of the capstone and the panel size and pattern has been developed using the Monument stones as a reference. The entire building is wrapped in an ornamental bronze lattice that is a historical reference to African American craftsmanship. The density of the pattern can be modulated to control the amount of sun¬light and transparency into the interior. The south entry is composed of the Porch and a central water feature. An extension of the building out into the landscape, the porch creates an outdoor room that bridges the gap between the interior and exterior. At 50m (49’-2”) deep, the setback is similar to other buildings on the north side of the Mall. The underside of the porch roof is tilted upward allowing reflection of the moving water below. This covered area creates a microclimate where breezes combine with the cooling waters to generate a place of refuge from the hot summer sun. There is also an outdoor patio on the porch rooftop that is accessed from a mezzanine level within the building.